For the listed company in the Shanghai Stock Exchange, see Yatai Group. A yatai (屋台) is a small, mobile food stall in Japan typically selling ramen or other food. The name literally means "shop stand". The stall is set up in the early evening on pedestrian walkways and removed late at night or in the early morning hours. Though the practice of mobile food stands dates back to the 17th century, yatai became popular and widespread in the Meiji period (1868–1912) and were two-wheeled pushcarts constructed of wood. Yatai were popular during and following World War II, but Japanese authorities imposed regulations ahead of the 1964 Tokyo Olympics, citing health concerns. Today, they are prevalent in Fukuoka City, Fukuoka, but continue to dwindle. 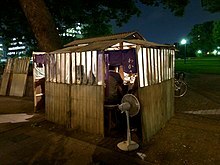 A yatai in Tokyo area during its closed hours. Yatai are typically wooden carts on wheels, equipped with kitchen appliances and seating. Handles and seating fold into the cart while it is being transported. A pushcart usually measures 3 by 2.5 meters. Vendors serve a variety of foods, from traditional Japanese cuisine such as ramen, gyoza, and tempura. Beer, sake, and shōchū are usually available. Carts open after sunset and close in the early morning. Closed yatai in a car park in Fukuoka, Japan. Yatai selling buckwheat soba date back at least to the 1600s,:22 and major cities such as Tokyo could have thousands. A reference to yatai in the modern sense is found as early as 1710. The word appears in an Edo-period sharebon, a genre of literature revolving around the pleasure quarters. Yatai are descended from food stalls established outside of Buddhist shrines from the 5th to 7th century. Historian Hiroaki Ichikawa has said the origins of contemporary yatai are in the Tokugawa period, during which dignitaries of the court would often travel between the capital and their homes. As these dignitaries traveled, yatai provided a simple food option. A yatai selling ramen beside the Naka-gawa (Naka river) in Fukuoka, Fukuoka Prefecture, Japan. The last remaining yatai in Kumamoto Prefecture. The contemporary hub of yatai culture are the Nakasu and Tenjin districts in Fukuoka City of Fukuoka Prefecture. As yatai regulations were implemented at the local level across Japan, Fukuoka's yatai operators created a trade association and were mostly unaffected. The number of yatai has dwindled in most major metropolitan areas, though leveled in the early 21st century in response to Japan's economic stagnation and yatai's relatively low cost. Nonetheless, in Fukuoka prefecture, the number of carts has declined since the 1960s from 450 to just 100 as of December 2018. The process has been accelerated by a 1994 law stating that yatai must be passed to a direct descendant, or closed, upon the retirement of the operator. Fortunately, Fukuoka has relaxed these regulations and recently announced the availability of 14 new licenses as of 2019. In Kumamoto Prefecture, just south of Fukuoka, a single yatai remains in Kumamoto City, Wakaki (わかき), which holds the last remaining yatai license in the prefecture. When the owner retires, the yatai culture in Kumamoto will come to an end. The proprietress serves oden and an assortment of drinks. She has regular customers and welcomes foreigners as well. She often jokes that she has the most expensive toilet of any restaurant in Kumamoto since customers use the toilet in the local park, which was built for over ¥10,000,000 (about $90,000 USD). The ornate floats seen in some of the Japanese festivals, such as in the seasonal Takayama Festivals in Gifu Prefecture, are also known as yatai. In contrast to the human-borne floats common to most Japanese festivals, they consist of elaborately-decorated wheeled carts, some of which also contain intricate mechanical puppets which perform during their procession. During the remainder of the year, several of the floats are displayed in the town's festival float museum, known as the Yatai Kaikan (屋台会館). ^ a b c Murakami, Hyōe; Richie, Donald, eds. (1980). A Hundred More Things Japanese. Tokyo: Japan Culture Institute. pp. 66–67. ISBN 9780870404726. LCCN 81112282. OCLC 7133178. ^ a b "屋台" [Yatai]. Nihon Kokugo Daijiten (in Japanese). Tokyo: Shogakukan. 2012. OCLC 56431036. Retrieved 2012-09-05. ^ a b c "Meals on Wheels". Fukuoka Now. Fukuoka Now. 24 October 2011. Retrieved 3 March 2016. ^ a b c d e Liaw, Adam (7 May 2013). "Saving Fukuoka's Street Food". Wall Street Journal. Wall Street Journal. Retrieved 3 March 2016. ^ a b Hayata, Eisuke (8 September 2007). "Hakata 'yatai' days numbered as owners age, tape gets redder". Japan Times. Japan Times. Retrieved 3 March 2016. ^ De Mente, Boye Lafayette (2009). Amazing Japan! : Why Japan Is One of the World's Most Intriguing Countries. Cultural Insight Books. pp. 49–50. ISBN 0914778293. ^ "Fourteen New Yatai Licenses Available in Fukuoka". Fukuoka Now (in Japanese). Retrieved 2018-12-19. Wikimedia Commons has media related to Yatai. This page was last edited on 15 February 2019, at 21:08 (UTC).